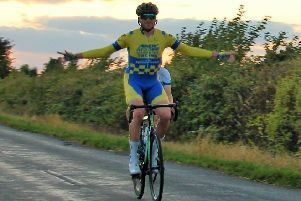 Aaron Chambers-Smith and Dean Watson cross the line in first and second at Dinnington. In a stunning performance in the latest race at Dinnington, the Andy Moore Autocentres/J.E.James Racing Team completed a clean sweep thanks to Aaron Chambers-Smith, Watson and Steve Paterson. And the dominant display won rich praise from team boss Moore, who said: “The performance was simply sublime. The lads were perfection. The Moore team fielded a squad full of firepower for the peunultimate race of the series. 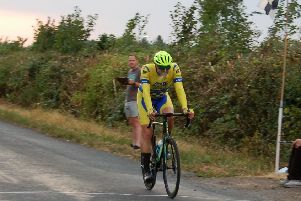 The boss directed his troops to attack the course from the outset, and junior Harry Buxton established the early position in a meaningful break of four riders. Andy Bishop waited for the peloton to close and immediately launched a strong counter-attack, opening up a 15-second lead. Keen to join in the chase, Chambers-Smith, Paterson and Watson all spotted the opportunity and jumped across to form a formidable strike trio at the head of the race. A 20-second advantage over the pursuing bunch looked comfortable, but Chambers-Smith was keen to apply further pressure and attacked hard to break away with two laps to go. It seemed a monumental challenge for the youngster to maintain the solo effort, but help was at hand from Watson, who sprinted clear of the rest in a sledgehammer attack, and the pair crossed the line in close proximity, with Paterson third, Bishop sixth and Buxton eighth.